The non-profit Museum of Lifestyle & Fashion History will premiere the eleventh annual Children & Parents Day celebrating the Blueberry Fruit on Sunday, March 5, 2017. This educational family day is multi-generational. Children & Parents Day will be held again at the historic Boynton Woman’s Club in Boynton Beach, Florida. 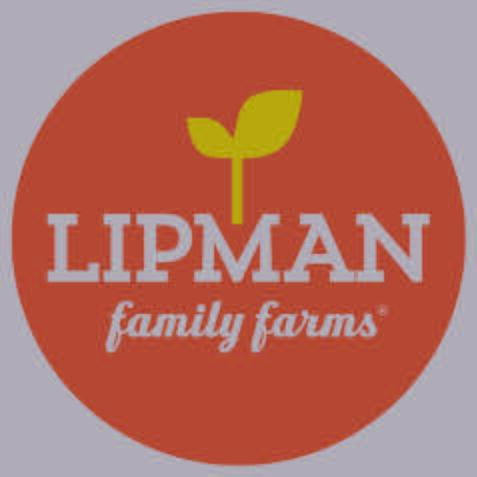 Sponsors include Lipman Family Farms, The Palm Beach Post, Macaroni Kid Boynton Beach & Lake Worth, Macy’s, Iris Apfel, Boris & Edith Rueger Fund and the Patricia Ann Ravo Fund. 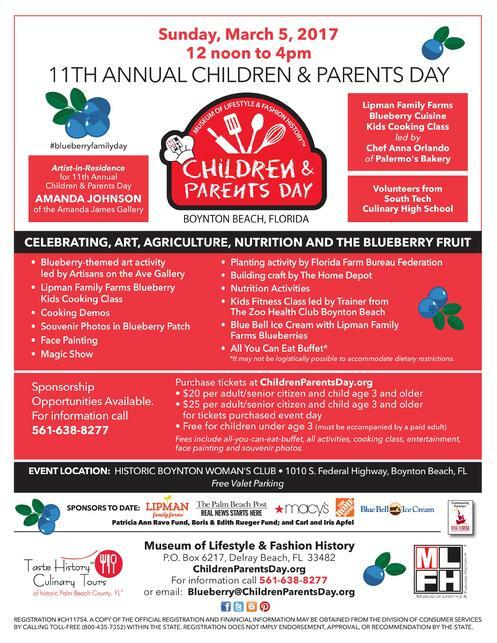 The theme for the eleventh annual Children & Parents Day in Boynton Beach, Florida is celebrating the Blueberry Fruit and National Nutrition Month. Since the 1890s, Blueberry farming has been in Florida. This family day event has evolved to incorporate healthy eating presentations, culinary demos, kids cooking classes, art-making for kids and their families; and literacy activities. The blueberry fruit theme will be incorporated in all aspects of the one-day event that involves live blueberry painting, arts and crafts workshops conducted by local artists, storybook reading, face painting, souvenir photos, kids exercise activity, cooking demos and a kids cooking class. The six-course blueberry-infused all-you-can-eat farm-to-table buffet is being designed by high school students in the South Tech Culinary Academy of Boynton Beach, Florida. Some other activities will be led by Amanda Johnson of the Amanda James Gallery; The Home Depot; Chef Anna Orlando of Palermo’s Bakery; Blue Bell Creameries, Florida Farm Bureau Federation and Artisans of the Ave Gallery. Amanda Johnson of the Amanda James Gallery of Downtown Boynton Beach is the 2017 Artist-in-Residence for the 11th annual Children & Parents Day. 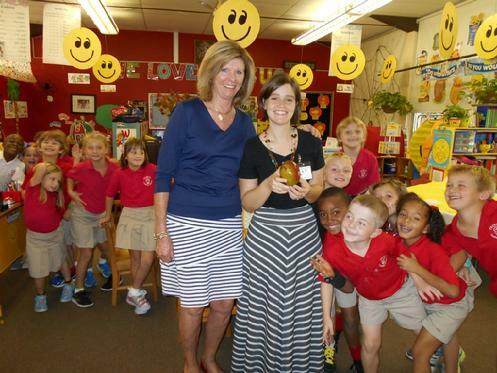 Johnson will conduct a live participatory blueberry-themed mural at Children & Parents Day. Kids and their parents can join in painting the mural. The Home Depot will lead children with creating a nature-related building craft. The Museum of Lifestyle & Fashion History’s 11th annual Children & Parents Day is Sunday, March 5, 2017 from 12 noon to 4pm at the historic Boynton Woman’s Club located at 1010 S. Federal Highway, Boynton Beach, Florida. The historic Boynton Woman's Club, 1010 S. Federal Highway, Boynton Beach. The Boynton Woman’s Club is an original 1926 Addison Mizner designed building that is on the National Registry of Historic Places. Complimentary valet parking will be provided.